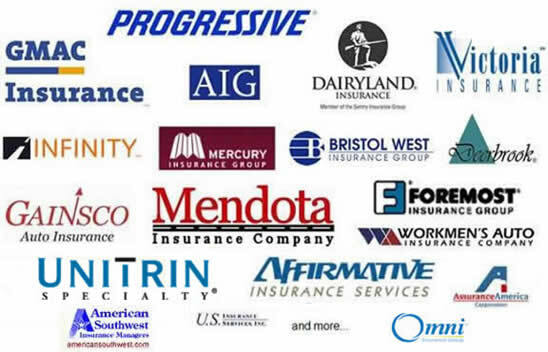 There are more than 50 auto insurance companies in California. California auto insurers include big national players like Farmers Insurance as well as smaller local players. Some companies like 21st Century Insurance don’t insurance fancy expensive cars like Ferrari, Rolls Royce, etc. If you have one of these cars then Access Insurance is your company. This guides lists top ten auto insurance companies in California with their pros and cons. We have depended heavily on individual auto insurers’ websites as well as information available on California Department of Insurance’s website. With lousy and confusing website Interinsurance Exchange of the Automobile Club (a.k.a. AAA Southern California) is this is the second largest California auto insurer. It had 8.5% market share in terms of exposure count. AAA Northern was the third largest with 7.23% market share. Some things to keep in mind if you are planning to buy auto insurance from these companies. AAA NCNU IE will not sell insurance if you have 1 speeding ticket and 1 at fault accident in last three years. If your license is less than three years old you can’t buy insurance from AAA. Offers automobile death benefits coverage of $15,000 for each insured person. The company claims to offer substantially cheaper (by $384) insurance than GEICO, State Farm, and Farmers. 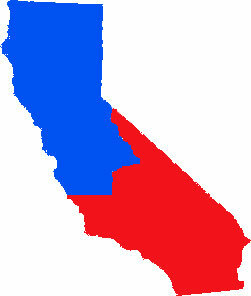 The map below shows how northern and southern California is split between the two AAA’s. Allstate is the third largest auto insurance company in California. It had a market share of 6.7% in 2011. The company offers auto insurance all over the Golden State. Your Choice Auto is the most popular policy issued by Allstate. The company also offers auto insurance for expensive and luxury cars like Porche and Jaguar. You can find a Allstate’s complete list of insured makes here. Mercury Insurance Group is the fourth largest California auto insurance company with a 6.5% market share. Mercury sells reasonably priced auto coverage. The company had zero justified complaints in 2011, two in 2010, and just five justified complaints in 2009. Mercury’s justified complaint ratio is also the lowest amongst all California auto insurance companies. This makes Mercury the best auto carrier in terms of quality of customer service and claims processing. Mid Century Insurance Company is a subsidiary of the Farmers Insurance Exchange. It is a non standard high risk insurance company. If your driving record has more than one at fault accident or too many speeding tickets then standard or low risk auto insurance companies will not cover you. For high risk drivers Mid Century can be a good choice. Downside is that the cost of insurance is on the higher side. This does not mean that you should not buy from this company if you have a good driving record. The company offers Safe Driving Discount of up to 9% and Good Driver Discount of 20%. The company has 5.7% market share. Another wholly owned subsidiary of Farmers 21st Century Insurance Company has 3% market share in California. The company insures fancy cars like Ferrari, Jaguar etc. The company offers superior driver discount of 10% if the driver is accident and violation free for 4 years. If driver has a five year plus clean record the discount is 20%. The cost of the company’s policy is slightly on the higher side. Access is a speciality auto insurer with 2% market share. The company offers cheap auto insurance for standard cars like Honda Accord as well as expensive cars like BMW 328i. The company sells through insurance agents. Auto insurance is an important coverage and should be selected for care. There are smart ways of lowering your auto insurance quotes but cost should not be the only consideration. Act smart and buy a policy as per your needs and from a reputable carrier. Automobile Club of Southern California is a totally separate company than the California State Automobile Association.